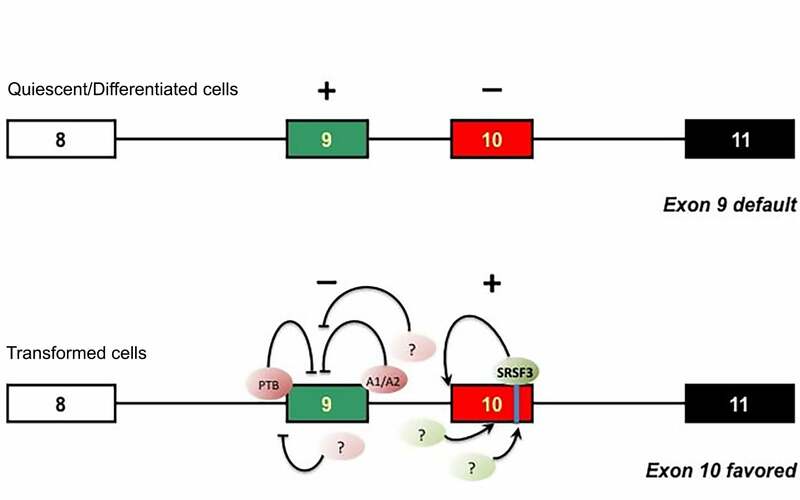 In contrast to splicing in differentiated (normal) cells, oncogenic splicing factors in transformed (cancer) cells trigger the inclusion of exon 10 instead of exon 9. Cold Spring Harbor, NY — Cancer cells maintain their life-style of extremely rapid growth and proliferation thanks to an enzyme called PK-M2 (pyruvate kinase M2) that alters the cells’ ability to metabolize glucose—a phenomenon known as the Warburg effect. Professor Adrian Krainer, Ph.D., and his team at Cold Spring Harbor Laboratory (CSHL), who seek to reverse this effect and force cancer cells to regain the metabolism of normal cells, have discovered details of molecular events that cause cancer cells to produce PK-M2 instead of its harmless counterpart, an isoform called PK-M1. Their study, performed in collaboration with Professor Lewis Cantley, Ph.D., and his colleagues at Harvard Medical School and The Koch Institute, in Cambridge, Mass, appears on November 1 in the Journal of Molecular Cell Biology. Both protein isoforms—PK-M2 and PK-M1, the latter of which is found only in normal cells—are both encoded by the same gene, PK-M, in a mutually exclusive fashion via a process called alternative splicing. After the gene is transcribed to produce RNA, unneeded bits called introns are first spliced out. How the remaining bits, called exons, are stitched back together by the cell’s splicing machinery decides which protein version is produced. In the case of the RNA transcript for PK-M RNA, the choice is between two exons: exon 9, found in PK-M1; and exon 10, whose inclusion results in PK-M2 production. “In this study, our goal was to determine what exactly the splicing machinery looks for when it’s trying to decide which exon to include and which exon to exclude,” specifies Krainer. Following a series of experiments in which the team manipulated the two exons within a precursor form of the RNA PK-M by duplicating them, swapping their positions, etc., the scientists discovered that the signals for mutually exclusive splicing reside within the two exons themselves. The exon 10-inclusion signal is a potent splicing “enhancer”—a sequence of nucleotides or “bases” that differs from its counterpart in exon 9 by a mere two nucleotides. These two so-called “wobble bases” are responsible for recruiting a splicing protein called SRSF3, the team has found. 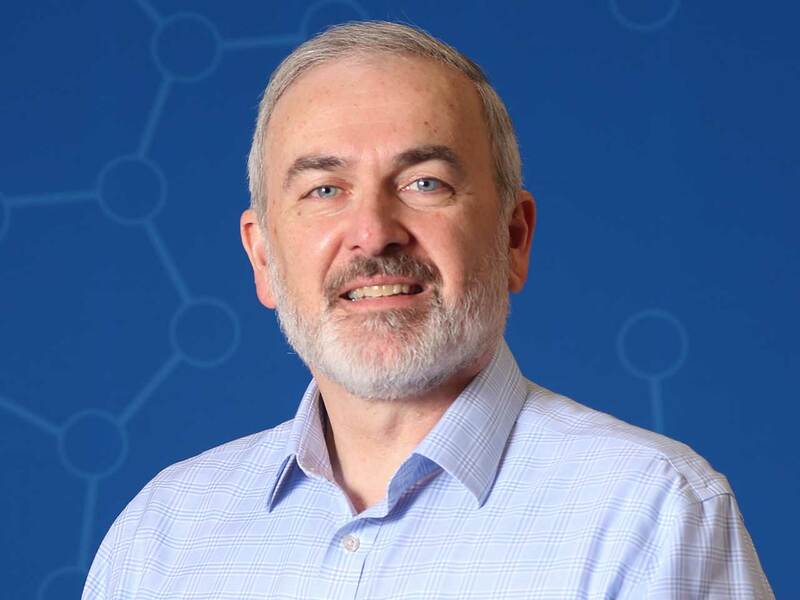 “Our discovery that SRFS3 plays a role in promoting the Warburg effect is consistent with other studies that recently identified this protein as having oncogenic properties and found it to be produced at high levels in ovarian and cervical cancer cells,” says Krainer. SRSF3 itself might not make for a good therapeutic target, as it oversees splicing in numerous other genes unrelated to cancer. But Krainer’s team is focusing on finding ways to redirect splicing to force cancer cells to preferentially include exon 9 and thereby produce PK-M1 instead of PK-M2. The team has previously been successful in correcting a splicing defect that causes the neuromuscular disease, spinal muscular atrophy, using “antisense” technology—which involves synthetic nucleotide sequences—to redirect splicing to force the inclusion of a single exon. “The task at hand is more challenging because it involves mutually exclusive splicing in which one exon has to be included while the inclusion of the other exon has to be prevented,” explains Krainer. This work was funded by a grant from the Starr Cancer Consortium. “Exon-centric regulation of pyruvate kinase M alternative splicing via mutually exclusive exons” appears in the Journal of Molecular Cell Biology on November 1. The full citation is: Zhenxun Wang, Deblina Chatterjee, Hyun Yong Jeon, Martin Akerman, Matthew G. Vander Heiden, Lewis C. Cantley, and Adrian R. Krainer. The paper can be downloaded at http://jmcb.oxfordjournals.org/content/early/2011/10/31/jmcb.mjr030.short?rss=1.